For other uses, see The Second City (disambiguation). The Second City is an improvisational comedy enterprise, best known as the historically first on-going improvisational theater troupe, continually based in Chicago. It also has training programs and live theatres in Toronto and Los Angeles. The Second City Theatre opened on December 16, 1959, and has since become one of the most influential and prolific comedy theatres in the world. The Second City has produced television programs in both Canada and the United States, including SCTV, (SNL), Second City Presents, and Next Comedy Legend. 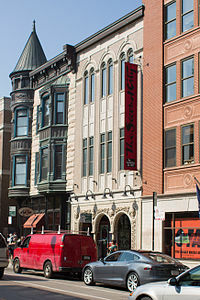 Since its debut, The Second City has consistently been a notable starting point for comedians, award-winning actors, directors, and others in show business, including Bill Murray, Gilda Radner, John Candy, Dan Aykroyd, Del Close, Eugene Levy, Catherine O'Hara, Nia Vardalos, Ryan Stiles, Mike Myers, Steve Carell, Tina Fey, Amy Poehler, Stephen Colbert, and many others. The Second City chose its self-mocking name from the title of an article about Chicago by A. J. Liebling, published in The New Yorker, in 1952. In summer 1955, at The Compass bar in Hyde Park, University of Chicago students, led by Bernard Sahlins and Paul Sills, calling themselves Compass Players, began a "commedia dell'arte", based on professional theater games taught by Viola Spolin, who was the mother of Sills. They soon began performing occasional shows on the Near North Side. On December 16, 1959, The Second City's first revue show premiered at 1842 North Wells Street, with Sills' former wife and Compass Player Barbara Harris singing “Everybody’s in the Know. Admission was $1.50. Sahlins and Sills flipped burgers in the kitchen." Sahlins, Sills, and Howard Alk had founded the theater, in 1959, as a place where scenes and stories were created with improvisation, using techniques that grew out of Spolin's innovative teachings, later known as Theater Games, with Sills as its director. The cabaret theater comedy style of the Second City tended towards satire and commentary of current social norms and political figures and events. In 1961, the theater sent a cast to Broadway with the musical revue, From the Second City, directed by Sills and earning a Tony nomination for ensemble member Severn Darden. The company moved a few blocks south, to 1616 North Wells, in 1967. Eventually, the theater expanded to include three touring companies and a second resident company, and now fosters a company devoted to outreach and diversity. The style of comedy has changed with time, but the format has remained constant. Second City revues feature a mix of semi-improvised and scripted scenes, with new material developed during unscripted improv sessions after the second act, where scenes are created based on audience suggestions. A number of well-known performers began careers as part of the historic troupe, then moved to television and film. In 1973, The Second City opened a theater in Toronto. 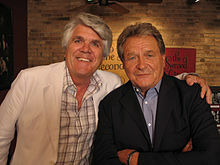 By the mid-1970s, both venues became a source of cast members for Saturday Night Live and SCTV, which borrowed many of the writing and performing techniques pioneered by The Second City and other improv groups. In 1983, the adjoining e.t.c. theater became the second resident stage at its Old Town, Chicago location, handling overflow crowds and increasing the number of resident company members. Co-founder Bernie Sahlins owned the theater company until 1985, before selling it to Andrew Alexander and Len Stuart. Along with its theaters, training centers, and television shows, The Second City also produced improv and sketch shows for Norwegian Cruise Line, through 2017. In the 2000s, Second City launched productions in regional theaters around the country; revues featured sketches written for and about each location, including Phoenix, Boston, Baltimore, Dallas, and Louisville. Second City Television, or SCTV, was a Canadian television sketch comedy show offshoot from the Toronto troupe of the Second City and ran from 1976 to 1984. Dr. Charles A. "Chuck" Allard (1919 – 1991) (father of Vancouver attorney Peter Allard, formed a partnership, in 1981, that acquired the fledgling series, which he then moved from Toronto to Edmonton (where he practiced medicine and had co-founded the Edmonton Oilers as a silent partner with "Wild Bill" Hunter). The basic premise of SCTV was based on a television station in the fictional city of Melonville. Rather than broadcast the usual TV rerun fare, the business, run by the greedy Guy Caballero (Joe Flaherty) sitting in a wheelchair only to gain sympathy and leverage in business and staff negotiations, operates a bizarre and humorously incompetent range of cheap local programming. The range included soap opera "The Days of the Week"; game shows, such as "Shoot at the Stars", in which celebrities literally are shot at in similar fashion to targets in a shooting gallery; and movie parodies, such as "Play it Again, Bob" in which Woody Allen, as played by Rick Moranis), attempts to entice Bob Hope, (as played by Dave Thomas), to star in his next film. In-house media melodrama was frequently satirized, including by John Candy, as the vain, bloated variety star character, Johnny La Rue; Thomas's acerbic critic, Bill Needle; Andrea Martin's flamboyant, leopard-skin clad station manager, Mrs. Edith Prickley; Catherine O'Hara's alcoholic, narcissistic, former leading-lady, Lola Heatherton; and Flaherty's effusive talk show host, Sammy Maudlin. Martin Short also originated his dorky Ed Grimley character here, which he later brought to Saturday Night Live. Opened in 1972, Andrew Alexander took the reins of The Second City Toronto in 1974, then formed a partnership with Len Stuart in 1976, starting The Second City Entertainment Company. Its inaugural television production was SCTV that year. Alexander co-developed and executive produced over 185 half-hour shows for the series. In 1985, Alexander and Stuart acquired Chicago's Second City. He has produced or executive-produced over 200 Second City revues in Canada and the United States. Alexander expanded The Second City TV & Film Division with offices in Los Angeles and Toronto. As of 2014[update], the Second City has been awarded thirty-seven Equity Joseph Jefferson Awards, which have recognized them for Best Revue five times, the first being Paradigm Lost (1997). The revue’s director, Mick Napier, is one of several directors recognized by the Jeffs, a list that includes founder Bernard Sahlins (for 1983’s Exit, Pursued by a Bear) and improv guru Del Close (1981’s Miro, Miro on the Wall). Sixteen alumni have received Jeff Awards for their performances in Second City revues, including David Pasquesi (The Gods Must Be Lazy, 1989), Scott Adsit (Paradigm Lost, 1997), Jackie Hoffman (Disgruntled Employee Picnic, 1993), Shelley Long (Wellsapoppin, 1977), and Nia Vardalos (Whitewater for Chocolate, 1994), with Rachel Dratch and Keegan-Michael Key each being honored twice. In 2009, as the company was celebrating its 50th year, the Second City was awarded an honorary Jeff for the milestone, as well as three awards for the e.t.c.' s 33rd revue Studs Terkel's Not Working, recognizing director Matt Hovde and actress Amanda Blake Davis and naming it Best Revue. In 2011, the e.t.c. 's 35th revue Sky's the Limit (Weather Permitting) won the Jeff for Best New Work (Musical or Revue), as well Best Revue and Best Actor, for ensemble member Tim Baltz. The following year, the e.t.c. 's 36th revue We're All In This (Room) Together won for Best Revue and Best Director of a Revue (Ryan Bernier), while ensemble member Edgar Blackman took home the Jeff for Best Actor/Actress in a Revue for his work in Who Do We Think We Are? on the Second City mainstage. In 2013, the Jeff Awards awarded Best Production: Revue to a Second City show not housed at the venue on Wells Street, The Second City Guide to Opera, a collaboration with the Lyric Opera of Chicago that had been initiated by soprano and Lyric creative consultant Renée Fleming, with Best Director: Revue going to Billy Bungeroth. Toronto's Second City mainstage troupe has won ten Canadian Comedy Awards: Best Improv Troupe (2001), Best Sketch Troupe (2001, 2006 and 2009), and Best Comedic Play winners Family Circus Maximus (2002), Psychedelicatessen (2003), Facebook of Revelations, Barack to the Future (2009), 0% Down, 100% Screwed (2010) and Something Wicked Awesome This Way Comes (2011). Goldstein (1964) – The directing debut of Philip Kaufman (The Right Stuff, The Unbearable Lightness of Being) featured several members including Severn Darden, Jack Burns, and Del Close, as well as teacher Viola Spolin. A modern-day interpretation of the story of Elijah, it won the Prix de la Nouvelle Critique at the Cannes Film Festival, and Jean Renoir called it the best American film he'd seen in twenty years. The Monitors (1969) – A satirical alien invasion film in which earth's invaders run the planet as though they were 1950s hallway monitors, featuring members Avery Schreiber, Alan Arkin, Fred Kaz, and Peter Boyle. Second to None (2001) – A documentary by Matt Hoffman and Scott Silberstein about the process of writing Paradigm Lost, following the cast and director Napier from the initial rehearsal through opening night. Originally narrated by alum Jim Belushi, the film was reworked, with rehearsal footage added, ten years after its initial release. The Second City: First Family of Comedy (2006) – A documentary by Sharon Bartlett and alum Dave Thomas in three parts, focusing on the origins of The Second City in Chicago, the life of SCTV, and the success of notable alumni, including Tina Fey, Mike Myers, Ryan Stiles, Patrick McKenna, and Martin Short. I Want Someone to Eat Cheese With (2006) – An independent film starring, written, directed and produced by Jeff Garlin, himself a former Second City actor, features scenes shot within The Second City's Chicago theater, and features several of its alumni, including Mina Kolb, David Pasquesi, Amy Sedaris, Richard Kind, Dan Castellaneta, Tim Kazurinsky, and Bonnie Hunt. Don't Think Twice (2016) – A film written and directed by Mike Birbiglia centered around an improv troupe dealing with the effects of one member's success stars Second City alumni Tami Sagher, Steve Waltien and Keegan-Michael Key. The film features archival footage and photographs of Second City ensembles in the course of establishing the roots of improv comedy in Chicago. Created in 1967 as a way to increase the talent pool, the initial Touring Company, featuring Ramis, Doyle-Murray and Flaherty, was tested on the road for two years before taking the stage as The Next Generation after the mainstage ensemble was sent to perform in New York. The Touring Company continued to perform greatest hit shows on the road, and in 1982, with the assistance of producer Joyce Sloane (and without Sahlins's knowledge) they staged an original revue in what would become the theater's second stage, the Second City e.t.c. In December 2009, the theater celebrated its fiftieth anniversary with a weekend of panels and performance which featured many prominent alumni, including an SCTV reunion show starring Joe Flaherty, Eugene Levy, Andrea Martin, Catherine O'Hara, Harold Ramis, Martin Short, and Dave Thomas. Other notable alumni returning to participate included Steve Carell, Stephen Colbert, Jeff Garlin, Jack McBrayer, James Belushi, Dan Castellaneta, Amy Sedaris, Ian Gomez, Richard Kind, Robert Klein, Fred Willard, David Rasche, Betty Thomas, and George Wendt, as well as original cast member Mina Kolb, Compass Player Shelley Berman, and founders Bernard Sahlins and Sheldon Patinkin. The Second City Training Center was founded in the mid-1980s to facilitate the growing demand for workshops and instruction from the world-famous Second City theatre. Training Centers are located in Chicago, Toronto and Los Angeles. The Training Centers have grown substantially since the Second City Conservatory was established in the mid-1980s under the tutelage of longtime Chicago improv instructors and mentors Martin de Maat and Sheldon Patinkin. The Chicago Training Center has over 5,000 students in several disciplines, including improvisation and comedy writing. Former Training Center students include Steve Carell, Tina Fey, Amy Poehler, Mike Myers, Chris Farley, Tim Meadows, Bonnie Hunt, Stephen Colbert, Halle Berry, Sean Hayes, Amy Sedaris, Jon Favreau, Hinton Battle, Jack McBrayer, Dave Foley, and Kevin McDonald. Classes are taught by working professionals, many of whom are current and former Second City performers. In 2007, the Comedy Studies program was created, as a collaboration with Chicago's Columbia College, which provides students with an immersion in "all aspects of the study of comedy and improvisation"  In 2016, the Training Center expanded to include the Harold Ramis Film School, dedicated to comedy in filmmaking. The Second City Training Centers currently operate under the leadership of Kerry Sheehan, President, The Second City Training Centers and Education Programs. In the early years of the Second City and Game Theater, several parents and Lincoln Park community members—including Carol and Paul Sills and Mona and Dennis Cunningham—started a progressive school for their children, based on Viola Spolin's Theater Games techniques and philosophy with her son Paul Sills' refinements. Theater Games were gaining recognition and are now incorporated in drama therapy, play therapy, and are used as an educational tool. Early Second City and Game Theater members, as well as some Old Town and Lincoln Park community members, were closely involved, including the Sillses and Cunninghams, Viola Spolin, Joyce and Byrne Piven, John Schultz, Mel Spiegel, and Beverly Gold. The highly progressive curriculum included daily theater games, and some students went on to careers in entertainment. Briefly at the original Old Town theater site at the intersection of Clark, Wells, and Lincoln Avenue, the school moved to several locations in Lincoln Park before it closed in the mid-1970s. In 1971, The Players Workshop was Chicago's only official school of Improvisation for over a decade. Although it was never officially a part of The Second City cabaret theater, The Players Workshop was often referred to as Players Workshop Of The Second City, due to the school's close affiliation with the famous sketch comedy stage. ^ a b c d Christiansen, Richard (2004). Grossman, James R.; Keating, Ann Durkin; Reiff, Janice L. (eds.). Second City Theatre. The Electronic Encyclopedia of Chicago. Chicago Historical Society. p. 744. ISBN 0-226-31015-9. Retrieved March 7, 2008. ^ "Leadership - The Second City". ^ "Ellie Reed Cast In Netflix Comedy Series 'Girlboss', Signs With CAA". deadline.com. April 28, 2016. Retrieved May 3, 2017. ^ a b "History", The Second City, secondcity.com. Retrieved February 2, 2019. ^ Robertson, Campbell (June 4, 2008). "Paul Sills, a Guru of Improv Theater, Dies at 80". New York Times. Retrieved September 3, 2010. ^ Robrt L. Pela. "The Second City Does Arizona, Or Close But No Saguaro Proves There's Plenty of AZ to Poke Fun at Outside of SB 1070". Phoenix New Times. ^ Anderman, Joan (April 19, 2010). "From Chicago, joke's on Hub". The Boston Globe. ^ Smith, Tim. "Charm City gets Second City treatment". Baltimore Sun. ^ "The Second City Does Dallas: outsiders making astute observations". Star-Telegram. September 14, 2012. ^ Keane, Erin (January 2, 2011). "Second City seeks coup with Ville!'". The Courier-Journal. ^ Riess, Steven A.Sports in America from Colonial Times to the Twenty-First Century: An Encyclopedia, Routledge, USA, 2015, page 675. Retrieved October 10, 2018. ^ Lampard, Dr. J. Robert "Dr. Charles Alexander Allard", Profiles and Perspectives from Alberta’s Medical History, Alberta Medical Foundation, Edmonton, Alberta, Canada, 2008. Retrieved May 12, 2018. ^ "Jeff Awards List of Nominees and Recipients". ^ "Second City takes home Jeff Awards and announces complete 50th anniversary lineup". Time Out Chicago. 2009. Archived from the original on March 16, 2010. Retrieved September 3, 2010. ^ "Chinglish, Chicago Shakes, Candide, Porgy and Bess, Mike Nussbaum Among Jeff Award Winners". Playbill.com. 2011. Archived from the original on November 10, 2011. Retrieved November 8, 2011. ^ "'Iceman Cometh,' 'Follies' big Jeff Award winners". The Chicago Tribune. 2012. ^ "'Lyric Opera of Chicago & The Second City Take Home Two Jeff Awards for THE SECOND CITY GUIDE TO THE OPERA". Broadway World. 2013. ^ Doll, Susan. "Turner Class Movies Film Article: Goldstein". TCM.com. ^ Murray, Noel. "Goldstein/DVD". A.V. Club. ^ "Inside the Improv Process at Second City". The Chicago Sun Times. ^ Thomas, Mike (2009). The Second City Unscripted. Villard Books. pp. 34, 41, 146–150. ISBN 978-0-345-51422-6. ^ "Second City 50th Anniversary, SCTV Reunion: Live review". Time Out NY. Archived from the original on August 25, 2010. Retrieved September 3, 2010. ^ "What's in a Ticket". Broadwayworld.com. Retrieved September 3, 2010. ^ "The Second City Announces Complete 50th Anniversary Schedule". The Onion AV Club. Retrieved September 3, 2010. ^ Winchell, Stephen. "Inside the Second City's Comedy Studies Program". Splitsider. ^ Jones, Chris. "Second City to open Harold Ramis Film School, a first for comedy moviemaking". Chicago Tribune.